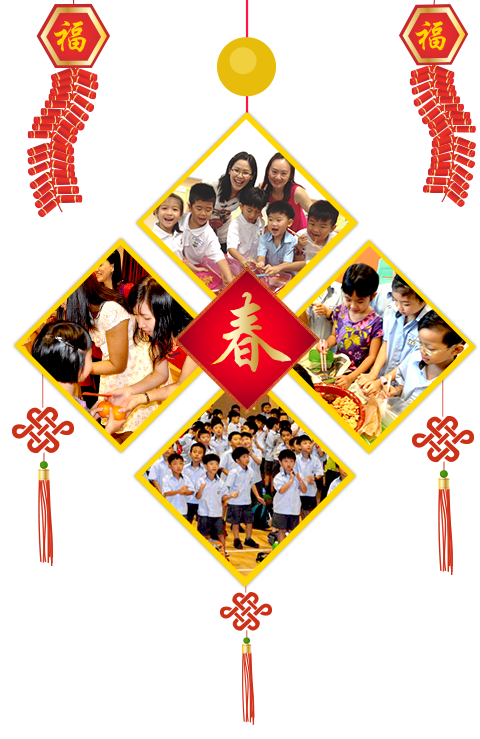 As we ushered in the year of the Horse, Alexandra Primary School celebrated its first Chinese New Year on 30 January 2014. This event provided an excellent opportunity for the Primary 1 students to learn the Chinese traditions and cultures in an interesting way. Beautiful Chinese New Year decorations were put up in the school. The Chinese Language Department planned a variety of meaningful classroom activities, such as Colouring of the Chinese Ethnic Costumes and Singing of the Chinese New Year Songs to liven up the festive atmosphere. On the day of the celebration, the staff and the students participated in the “Lou Hei” (also known as Prosperity Toss). This activity was conducted in the students’ respective classrooms. After that, the staff and the students proceeded to the school hall for an engaging and heartwarming concert. Wushu performance by Lim Xi Ian of One Optimism received overwhelming response from the audience. Mandarin oranges were given to the students and gift hampers were presented to the less privileged from the community. To end the concert, there was a mass sing-a-long session to wish all present a blessed Chinese New Year. This event generated a lot of excitement and joy among the staff and students. 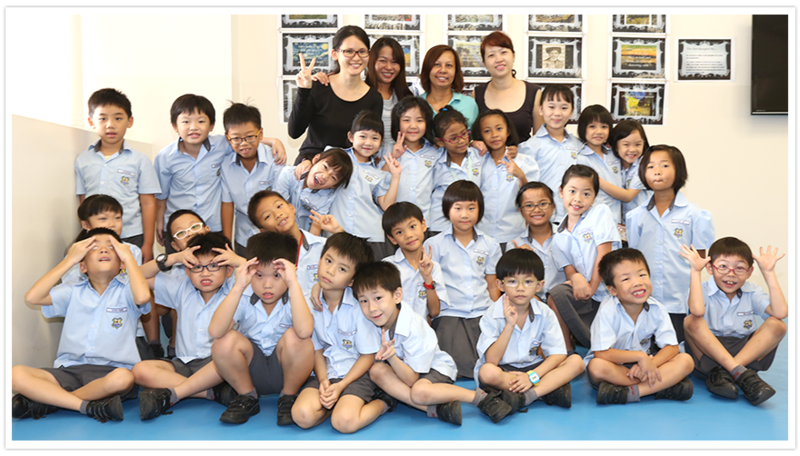 It was indeed an unforgettable celebration for everyone in Alexandra Primary School. In commemoration of Total Defence Day on 14 February 2014, the school staged a fire drill and carried out a food rationing exercise to let our students have a first-hand experience of what it would be like during times of war. These activities seeked to increase the students’ awareness on total defence and how they could play their part in protecting Singapore regardless of how young they are. Total Defence Day commemoration started with an assembly talk with a skit put up by our teachers. The skit highlighted the importance of preparedness and what a ready bag should comprise of so that our students would not be caught off-guard during an emergency. 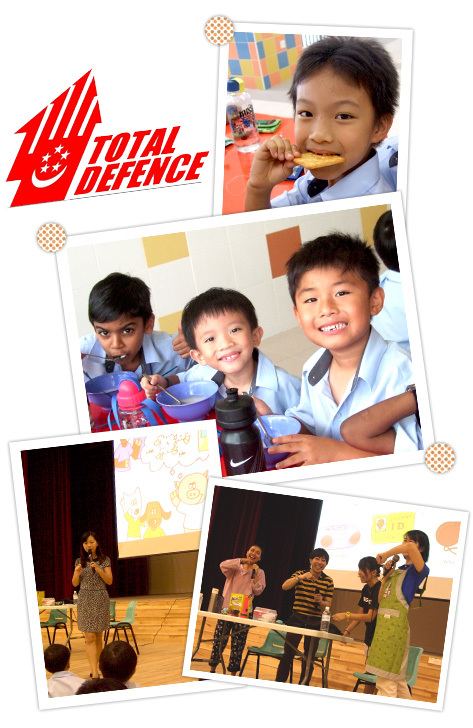 Students learnt about the 5 aspects of total defence and how they could play their part in total defence. During the food rationing exercise, only porridge and biscuits were on sale at the school canteen.